British Kitesports is the National Governing Body for the sport of Kitesurfing and is bringing the Wavemasters 2013 to the Isle of Tiree for the very first time. The competition, now in its 8th year, has come to Scotland mainland however has never come to Tiree. 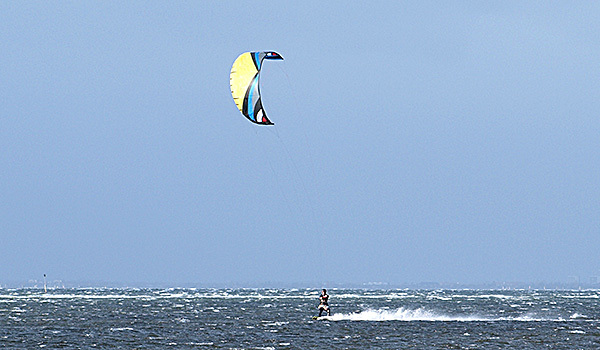 Kitesurfers use surfboards and kites to ride the waves and score points to advance in the competition in a knock out format. The kites are water re-launchable and if they go down in the surf will pop into the air again. Riders try and get the longest and biggest waves to score highly in their 7 minute heats. We are excited to come to the Isle of Tiree and sample the wind and waves it has to offer to make the week a memorable one – top riders from across the UK will be coming. Defending their titles are Scots George Noble from Fraseburgh and Kierra Alwood ( now residing in Norwich). The competition starts on the Tuesday and runs through to Saturday at various beaches on the island depending on the wind direction.